Holidays are a special time of family and friend gatherings, personal traditions and spiritual reflection. However, sometimes the many activities that accompany the holidays, such as shopping, wrapping, writing out cards, cleaning for company, and baking (to name a few), cause us to feel overwhelmed! In addition to holiday activities, we still have our regular routines of work and family life to continue. This often leaves little energy available for our own self-care. So what can you do to avoid becoming overwhelmed? The first part of beating holiday stress, is realizing that taking care of ourselves is an important step leading to happy, healthy holidays. By ensuring that we stay strong and healthy, we will be better equipped to take on the added activities and experiences that come along with the holiday season. The stress of the holiday season can be also be managed, and focused into meaningful experiences, by taking a moment to pause and to reflect on what is really important to us during this time of the year. Stick with your daily routine: Prioritize your daily activities such as your morning walk, your workout, or your book club. Those are the things that keep you going. Forget perfection: Don’t obsess over how things should be in a perfect world – if dinner is running a little late, or the house is a little cluttered, it isn’t the end of the world! Focus on enjoying your friends and family during these times! 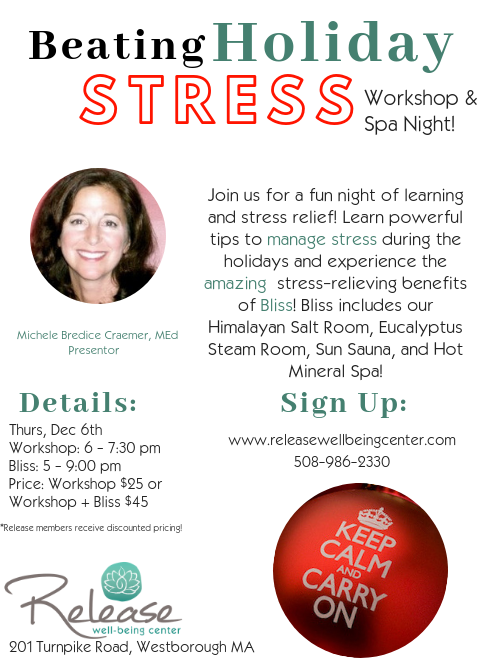 We are having a amazing workshop on BEATING HOLIDAY STRESS on Thursday, December 6th. It is a workshop and spa night combined! To learn more and to participate in some relaxation techniques such as deep breathing and visualization, come to Release for a fun night of learning healthy tips for the holiday season, along with enjoying the stress-relief benefits of Release’s Bliss area – Himalayan Salt Room, Eucalyptus Steam Room, Sun Sauna, Mineral Hot Tub, relaxing with friends!